Trish Van Camp Sewell obtained her Master of Music in Vocal Performance from Boston University and since then has been teaching, singing and acting for over 30 years in Los Angeles; Mesa, Arizona; and Central Oregon. 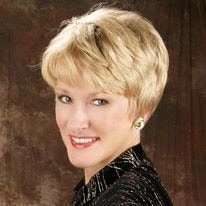 While in Los Angeles, she sang with the Curtain Call Dinner Theater; San Gabriel, LaMirada, and Burbank Civic Light Opera Companies; the Southern California Mormon Choir; Claremont Chorale; and was in demand as a soloist through the Los Angeles area. During the five years she lived in Mesa, Arizona she was in demand as a clinician and soloist; sang with the Phoenix Opera Company and Cantilena; taught the histories of Jazz and Rock, and voice classes at Mesa Community College; and taught private voice lessons. Trish currently sings with the Central Oregon Mastersingers, is the music director for BEAT’s current production of Oklahoma!, and will be the featured soloist for the Cascade Winds’ March performance. She was the music director for Topsoil Theatric’s production of Spring Awakening. She is also in demand as a soloist; teaches music history, voice classes and voice lessons at COCC; and teaches private voice. She has been involved with productions at Cascades Theatrical Company and Community Theater of the Cascades. Trish has also sung with Juniper Opera, Obsidian Opera, OperaBend, Shore Thing Productions, the Cascade Chorale, toured Germany with Oregon Festival Chorale, and has been a featured soloist with the Central Oregon Symphony. Trish currently studies with retired Metropolitan Opera artist Gail Dubinbaum Massaro. She has also studied with Phyllis Curtin, the first American inducted into the American Opera Singers Hall of Fame, and Dr. Susan St. John, Metropolitan Opera Council first place winner. While finishing her Bachelor of Arts in Vocal Performance, Trish was invited to New York City after a master class with the famed opera singer Beverly Sills. Favorite roles include Lily in The Secret Garden, Baroness in The Sound of Music, Witch in Into the Woods, Adele in Die Fledermaus, Anna in The King and I, Fiordiligi in Cosi fan tutte, and Musetta in La Boheme.